For the period of April 2018 to February 2019, the GOJ reported Total Revenues & Grants of $545.02 billion, $8.16 billion more than the Government’s projection. Year over year, this represents an increase of approximately 14.5% relative to the $476.14 billion recorded for the corresponding period in 2018. ‘Tax Revenue’ outperformed projections during the review period, while ‘Non-Tax Revenue’, ‘Capital Revenue and ‘Grants’ underperformed projections. ‘Tax Revenue’ amounted to $475.15 billion, $10.09 billion more than budgeted. Whereas, ‘Non-Tax Revenue’ was recorded at $59.67 billion which was $810 million or 1.3% less than budgeted. In addition, ‘Capital Revenue’ totalled $2.51 billion, $310.7 million or 11% less than budgeted. ‘Grants’ of $7.69 billion was reported; $811.8 million less than budgeted. Notably, no provisional amounted was booked for ‘Bauxite Levy’ for the review period. Total Expenditure for the period April 2018 to February 2019 amounted to $539.10 billion, $11.97 billion or 2.2% less than the budgeted $551.07 billion. Recurrent expenditure which totalled $483.63 billion, accounted for 89.71% of overall expenditures. Relative to projections, recurrent expenditure was $10.59 billion (2.1%) less than budgeted. 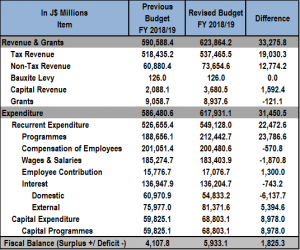 ‘Programmes’ which amounted to $181.86 billion was $5.84 billion or 3.1% less than projected, while ‘Employee Contribution’ which amounted to $14.26 billion for the period was under budget by 5.7% relative to the budgeted $15.12 billion. ‘Compensation of Employees’ amounted to $182.73 billion, $240.7 million or 0.1% less than projected. While, ‘Wages & Salaries’ amounted to $168.47 billion, 0.4% more than projected. As a result of the decrease in Expenditures for the period April 2018-February 2019, the ‘Fiscal Surplus’ was $5.92 billion, relative to a projected deficit of $14.21 billion. Additionally, the primary balance for the period amounted to $124.96 billion, 14.3% more than budgeted. As part of the Memorandum of Economic and Financial Policies (MEFP), the GOJ estimates that the primary balance, as a performance criterion, should amount to $142.14 billion by the end of the 2018/2019 fiscal year. As at the end of February 2019, this amounted to $124.96 billion. Tax Revenue is expected to total an estimated $537.47 billion by the end of the March quarter. The reported tax revenue for the end of February 2019 was $475.15 billion. The House of Representatives approved the Second Supplementary Estimates on January 15th, subsequent to the First Supplementary Estimates released on October 4th, 2018. “The Second Supplementary Estimates FY 2018/2019 was tabled in Parliament on January 8, 2019 and indicated total Central Government expenditure of $802,563.1mn, thus resulting in an overall net increase of $11,451.0mn above the First Supplementary Estimates of $791,112.1mn. It should be noted that the First Supplementary Estimates 2018/2019, had reflected a total Central Government expenditure for the fiscal year of $791,112.0mn comprising: Non-Debt Expenditure of $501,249.2mn; and Public Debt Service of $289,862.9 billion,” according to the Government. Approximately $3,000.0mn allocated to meet pension payments. $325.0mn outstanding refund to the Spectrum Management Authority. Revenue and Grants for FY 2018/19 is projected at $623,864.2mn and represents an increase of 11.3% over the FY 2017/18 outturn of $560,773.6mn. As a percentage of GDP, Revenue and Grants for FY 2018/19 are estimated to be 1.6 percentage points higher than the FY 2017/18 outturn. This growth is driven by Recurrent Revenue which accounts for 98.0% of total Revenue and Grants. Grants are also projected to increase over last fiscal year’s outturn, while Bauxite Levy and Capital Revenue have lower projected collections in comparison to the last fiscal year’s outturn. The Port Authority of Jamaica’s Business Process Outsourcing (BPO) Expansion Project.